Home Blog Magento Community vs Enterprise Edition – Which One Is Right For You? Magento Community vs Enterprise Edition – Which One Is Right For You? Industry 4.0 offers a crucial role for e-Commerce businesses across the world. Magento is a favorite and search engine friendly e-Commerce platform. It provides versions like Magento’s Community Edition and Enterprise Edition. Both are powerful and popular solutions differentiated by cost. The Community Edition is on an open-source platform free, though Magento Enterprise Edition is quite priced. Choosing the Magento version for your e-commerce store depends on a considerable number of aspects. Thus the article intends to help you with reasons and pointers around Magento Community vs. Enterprise Edition. 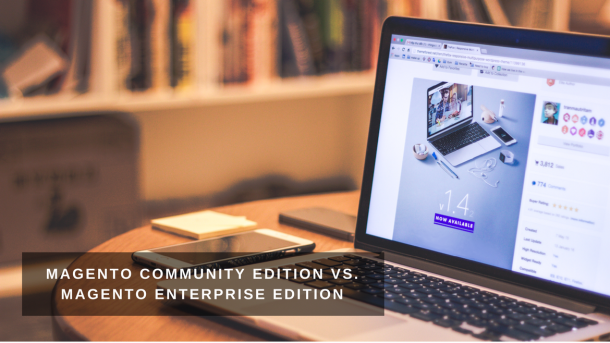 Which is a better Magento Edition – Community or Enterprise? We at Rishabh Software understand the complexities faced by businesses. Read on to learn from the write-up factors you need to consider while choosing the right version. Further, it will help in making informed decisions. Magento Community Edition is free, open source CMS that anyone can download and use to build their web store. It is ideal for small businesses that want to try their hands on building an eCommerce website. Since it is open source, it is easily customizable and makes use of the Magento extension marketplace to enhance the website’s functionality. However, it takes lot of time & the resource for any business with no or little experience, thus it is always advisable partnering with an experienced IT firm providing reliable web application development services to develop a bug-free Magento e-store. Magento Enterprise Edition as mentioned above is the premium and paid version of Magento. Its advanced capabilities have made it popular with many eCommerce giants to power their digital sales. Magento EE is completely supported by the Magento team and subscribers receive full customer service and support by phone and email. The pricing also includes security, special features and product improvements. The license fees cost about $22,000/year. Both platforms are open source, have the same set of core features and belong to the Magento ecosystem. They benefit hugely from Magento Connect – the Magento Extension marketplace and use apps to enhance functionality. Both Magento CE and Magento EE have access to the webservers API to integrate with different databases. Pricing: Magento Community Edition is free but Magento Enterprise Edition costs about $22,000/year. Additionally, you will incur implementation costs. Security: Magento CE lacks credit card tokenization or advanced payment security which can be a problem because these features are required for banks. The free version is not PCI compliant either. Scalability and performance: Magento Community Edition may often seem faster but that is because it is generally used by smaller Web Stores with lesser modules. Businesses that require more features and capabilities buy the Enterprise Edition because overall performance is much better with the paid version. EE allows websites to scale rapidly and provides support for running multiple databases that can be used for checkout, order management, products etc. The new Enterprise Cloud for EE dramatically speeds up deployment. Another EE benefit is full page caching as it ensures a smoother shopping experience. Functionality: On top of the core features, the paid version has many advanced features like segmentation with targeted offers, minimum advertised price, return management authorization, price and promotion permission, an enhanced catalog and CMS, call center software with assisted shopping etc. Dynamic marketing and search: EE is more focused on personalization, customer experience and analytics. It uses advanced content staging, sophisticated customer segmentation, targeted content and shopping cart reminder notifications. The Enterprise Edition also offers Elasticsearch which is a stellar feature allowing customers to locate products quickly. Further, customers can sort and narrow their results based on set criteria. Which Magento editions to choose? The free Community Edition is quite powerful and works just fine if your business doesn’t require a highly customized and scalable solution. But Magento Community Edition is essentially a developers’ platform. It is built for skilled developers and tech-savvy merchants who are familiar with the build/development aspect of the web store. Thus, for many businesses who have near-future expansion plans, it makes a lot of sense to invest in the Enterprise Edition, but the Community Edition works well if you don’t have the above feature requirements. If you are still unsure, consult an experienced Magento eCommerce development company to find the solution most suitable for you. Rishabh Software is a professional offshore web development company catering to retail clients around the world. Talk to our experts to know how we can help you in selecting the appropriate Magento solution for your business.